I don't read much nonfiction for leisure, but whenever I do I think I should read more. 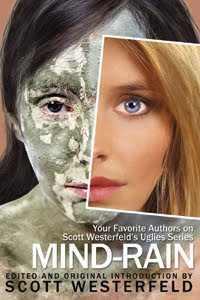 This particular book is a collection of essays on Scott Westerfeld’s UGLIES series. Anyone who loves to read knows what it's like to talk about your favorite book. I don't mean the gushing about how amazing it is, but when you really delve in and engage with characters and themes in ways you never have before. This book is packed with insight about Westerfeld’s series, and intriguing new perspectives that can prompt hours upon hours of debate. My favorite essay by far is Linder Gerber’s “Conformity by Design,” in which she addresses how we in the United States often consider conformity a negative thing, and instead value individuality much more. Drawing on Japanese culture (which ties in nicely with EXTRAS), Gerber points out some of the ways in which conformity can benefit society (and individuality hinder it). I enjoyed this essay so much because this viewpoint is, at least from my experience, rarely discussed in a culture that primarily sees conformity as a monster that devours individuality. I’m withholding specifics to make you go read it yourself, but Gerber uses some intriguing examples to emphasize that sometimes it’s a strength to see yourself as one tiny piece in a greater whole. I also really liked the second essay, “Best Friends for Never” by Robin Wasserman, mostly because I entirely agree with it! 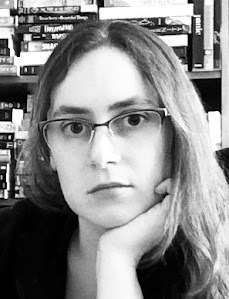 Wasserman claims that, though Tally is the protagonist, Shay is the real heroine of the story. Shay is the one who runs away from the controlling city. Tally only follows with the intention of betraying her friend so that she can become pretty and continue on with her average life. Once at the Smoke, Tally has no reservations about taking the attention of a guy Shay clearly liked, and seemed to actually be involved with. Not to mention that Tally’s betrayal leads to Shay’s capture, when she desperately wanted to avoid the operation. That’s book one. Wasserman lists many more of Tally’s betrayals and discusses how Shay is often an essential steppingstone for Tally’s success. I don’t dislike Tally quite as much as Wasserman seems to; she seems merely average to me and I find it hard to resent someone for not being incredible. I do, however, agree that Shay deserves more credit! Also included in MIND RAIN are two stories that served as loose inspiration for UGLIES with their debates about beauty. The first is Charles Beaumont’s “The Beautiful People,” which is very similar to UGLIES when you boil it down to basics. The second is Ted Chaing’s “Liking What You See: A Documentary,” which is absolutely fascinating! Westerfeld declares that his UGLIES series stemmed from an email discussion with Chaing about his story. The questions raised in “Liking What You See,” despite also being about beauty, are quite different than those raised in UGLIES, and in many ways impressively unique. Chiang approached the debate over beauty from a new angle: what if we could see appearance but not beauty? If we could recognize individual features and how they differ but we had no emotional reaction to those differences? All literature feeds your mind in one way or another; even when you dislike something, you critically engage by articulating why. “Liking What You See” took this to a higher level, and I felt like I had a buffet of promising discussions that I could “eat” over and over again without tiring of them. I’ve mentioned the pieces I liked the most already, but there were also one or two essays in here that I disagreed with. That’s the fun of discussing something! When we talk about a book, we have a chance to learn about different perspectives, which gives us an idea of the range of human understanding. If you have read UGLIES, then MIND RAIN is worth reading, too, because I guarantee there will be at least one viewpoint in there that hadn’t occurred to you before. 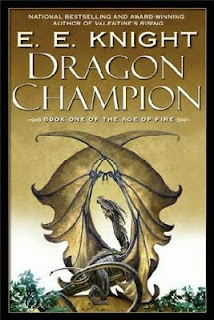 I never thought a fantasy epic about a dragon could feel so real! Especially one told through the dragon's perspective. Yet I always sympathized with Auron even (or perhaps particularly) when he acted more on animal instincts than humanized emotions and morals. From the unexpected, gory opening that sets a tone of survival, this is a fast paced and quite unpredictable book. Dragons are nearing extinction, and much of this story will reverberate with a too true realism regarding endangered species. Action abounds as the young dragon Auron finds himself attacked by humans, elves, dwarves, and even a pack of wolves. The dragon is no persecuted innocent, though, and I often felt torn between two understandable perspectives: Auron's simple and reasonable desire to live and his attackers' fear of an intimidating predator. Be warned that this book has its share of gore. Auron has to fight for his life with fresh ferocity in almost every chapter, and Knight describes these altercations in vivid detail - some battles more unpleasant than others. A few lines made me cringe and look away from the page as though that might clear the picture in my mind. I'm no fan of violence but I still relished this book, probably because the gore wasn't gratuitous. The many brawls and their striking description seem more intentioned to emphasize how cruel the world can be to an animal (or any outsider). Much of fantasy builds atop previously existing legends and folklore. Knight certainly cannot claim to have created the dragon, but what an author can claim is a unique take on a favorite theme. I'm always intrigued to see how writers incorporate or twist the already established understandings of fantastical creatures. Knight touches on all of the main assumptions about dragons that come to mind. Early on, the reader learns that dragons hoard gold and gems, because eating such minerals is necessary for the growth and strengthening of their scales. Later, dragons' tendency to kidnap and hold maidens hostage is addressed in a way that is both simple and convoluted at the same time. I enjoyed the entire book, but found the ending distinctly exceptional, and endings are high up on my list of what I value most about a book. Without specific spoilers, Auron comes to the realization that dragons, so rooted in instinct and tradition, must adapt. This is a humans’ (and elves' and dwarves') world now, and the choices are: adapt or die. 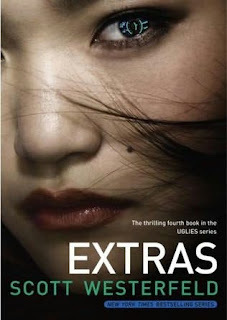 EXTRAS is the fourth book in the UGLIES trilogy. Yes, you read that right. Aya Fuse’s world feels both familiar and new at the same time. After Tally Youngblood spread the mind-rain three years ago, a new system of order developed in Japan, one in which fame functions as a currency. To say this book is intriguing is a serious understatement! Despite the technological differences between these futuristic cities and our current world, all four books resonate with simple, universal themes. The original trilogy's most obvious theme is beauty, a concept at the focus of countless philosophical discussions. Aya's city centers around something else: fame, another widespread preoccupation in our world. Like Tally, Aya isn't a deliberate rebel. She wants to fit in, or better yet to stand out - no, wait, she wants to fit in by standing out. She monitors her face rank vigorously, and devotes her life to plotting how she can boost her rating. Aya is a kicker, or someone who posts informative videos on her feed in hopes that enough viewers will make her famous. Like Tally met Shay, someone who didn't want the pretty surgery and forced her to see the world from a new perspective, Aya meets the Sly Girls. Unlike anyone Aya has known before, the Sly Girls try to keep their face ranks as low as possible, and Aya cannot comprehend this desire for anonymity. The "accidental rebel" trope is really a subtheme of what appears to be a Westerfeld staple, at least for this series: the imperfect hero. If you've already read SPECIALS, you'll remember how Tally - whoops - destroyed an entire base of weapons, giving Dr. Cable license to start a war. Aya also finds that in her desperation for fame she might have hurried her research, rendering the facts very, very wrong. This might sound minor, but I was particularly impressed with how Westerfeld handled the language barrier in his writing. Aya speaks Japanese, though, of course, we read her dialogue in English. When she meets some English speakers, there's the potential for language confusion (a problem many books run into when they, admirably, attempt to incorporate different language speakers into their story), but Westerfeld does a masterful job of subtly reminding us that Aya normally speaks Japanese, and of drawing our attention to places where conversation misunderstandings are rooted in Aya's imperfect grasp of English. Most of the time, I wince when reading scenes where characters are clearly switching languages, but Westerfeld slips this element in with ease! 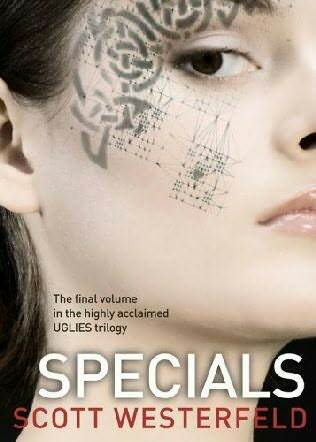 SPECIALS remains my favorite in the UGLIES series, but EXTRAS is a close second. More cool new technology, elements of traditional Japanese culture, and a critical examination into our fame fixation. This latter addition to a series doesn't disappoint! Never has a breakup been this hilarious. For inexplicable reasons, Colin Singleton finds himself frequently drawn to girls named Katherine. And then dumped by them. He has just been dumped by Katherine XIX, and, lost in self-pity, he allows himself to be whisked away on a road trip with his best friend, Hassan. They find themselves settling for a while in Gutshot, Tennessee where Colin, a former child prodigy, is determined to twist his devastation into something positive: he begins developing a mathematical formula that can predict the path of a relationship, including how long it will last and who will do the dumping. Colin's voice takes this book from amazing to absolutely, incredibly amazing. He’s never a character and always a person. Even if the reader doesn't share his intelligence or interests, they will relate to his emotions. Anyone who has ever been dumped, or even rejected in any form, will feel for his circumstance and root him on in breaking out of this pattern. Explicitly, the book deals with Colin's romantic relationships, but all nineteen are actually pre-novel, whereas his prominent relationship in the present (and for many years past) is his friendship with Hassan. Their dialogue proves that books can be as (or more) authentic than movies. Some novels can trip the reader up in imagining the character, setting, or specific gesture, but in ABUNDANCE OF KATHERINES, I had a clear image in my head for every conversation and action. So what about this math? Yes, there is math in the book. In fact, Green took every effort to ensure Colin's math makes sense, and the book is sprinkled with footnotes clarifying formulas and graphs. Do not be alarmed! Green also took every effort to ensure you don't have to be interested in math to like this book. Most of the footnotes actually aren't math related, but rather emphasize the vast trivia Colin knows. This isn't boring trivia either. A lot of it is pretty funny, and you'll probably find yourself telling your friends! In fact, most of the really detailed math has been relocated to the back of the book in the appendix. The actual story focuses on Colin's revelations about why his current formula isn't working. Math is the only way he knows how to analyze relationships, both on a global and personal scale. Colin's ultimate revelation isn't hard to predict, but I doubt surprising the reader is the point. This is Colin's story, after all, and it's a story about a prodigy's journey to understand what a lot of people around him have figured out already. Not that I'm going to tell you what that is! Let me emphasize how hilarious this book is: not only did I laugh out loud dozens of times, but I even found myself looking around a room, cursing the cruel world that there was no one nearby to share that last side-splitting line with. The characters are lovable and laughable. The writing is witty and wise. The relationships are complex and colorful. 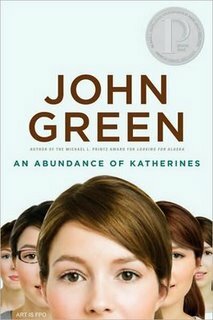 AN ABUNDANCE OF KATHERINES is no doubt an exceptional novel. This is by far my favorite book in the series. As I touched on in my reviews of UGLIES and PRETTIES, each book mimics Tally's current programmed mentality. In UGLIES, the writing is angst-heavy and emotional, as are uglies before the operation "fixes" all that. Then in the second book, Tally turns pretty, and the book often has a slow, confused sense. Actions are a little harder to follow, as is Tally's train of thought while she struggles to pull herself out of this enforced mind fog. Now, in SPECIALS, Tally has been altered again, and like the specials of the title, the writing of this book is intense. Every detail has an "icy" clarity, and much more attention is paid to sensory detail and miniscule observations, emphasizing that Tally's mind and senses are more awake than they have ever been before. We start to see the toll Tally's life has taken on her. Still only sixteen, circumstances have forced her to grow up too fast. She seems more mature in this book, which admittedly is in part because her brain has been adjusted for clearer thought, but there's more to it than that. Another reason I prefer this book to the first two is that Tally starts to do more for herself. For the first time, she rebels rather than being dragged into rebellion by someone else. She's tired of always being a creation, a toy, a project, a weapon, and she's determined to find herself buried beneath all the surgeries and politics and expectations. “Sometimes I think I’m nothing but what other people have done to me—a big collection of brain-washing, surgeries, and cures.” Need I say more? 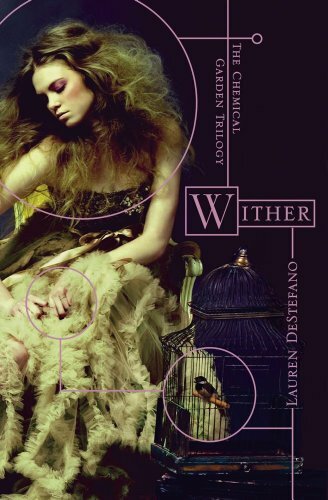 WITHER grabbed me from the first page with the intensity of its premise. In this futuristic dystopia, humans finally find a cure for cancer, only to realize, decades later, that something went wrong. For reasons unknown, women now only live to twenty, men to twenty-five. (But they're cancer free!) Women are often kidnapped as unwilling brides so men can procreate before dying. Rhine, our heroine, falls victim to this crime, despite her twin brother's determined efforts to protect her from such a fate. She never could have imagined how complicated her escape would become. DESTEFANO'S greatest strength is obvious: complex characters. Rhine constantly constructs easy descriptions and labels for the people around her, particularly her strange, new "family," only to find each individual surprises her again and again. Her eager, self-centered, younger sister-wife Cecily has moments of true tenderness and sacrifice. Her sullen, morbid, older sister-wife Jenna, the closest to death at nineteen, still occasionally bubbles over with youthful cheer. Linden, Rhine's captor and forced husband, turns out to be another breed of victim, which only makes it harder for her to hate him. The only villain here is Linden's father, Vaughn, and even he is humanized by his affection for his son. From complex characters stem complex relationships. Understandably, Rhine fixates on escape and freedom the moment she is kidnapped, but her determination wanes when she starts caring for the people around her: her sister-wives, her ignorant husband, her loyal attendants. She even pauses to wonder why she would run away from this life, with all its comforts and luxuries. Rhine's voice remains true to her sixteen years, and yet she demonstrates an unusual maturity not unbelievable for someone already 80% of the way through her short lifespan. An introspective person, Rhine finds quiet observation better suits her goals. She resists the temptation to lash out and instead works to gain the trust of those who now run her life, even if it means swallowing her bitterness and resentment. I found some minor logic issues with the plot. For one, Rhine struck me as a relatively intelligent, hardened young woman and I couldn't quite follow how she could fall for the bait that led to her capture. Her actions that day seem uncharacteristically naive and hopeful. I want to avoid spoilers here, but I will say that I also had some trouble understanding the security of the mansion. One moment it was described as impenetrable, an inescapable fortress, but more often it seemed Rhine could walk out whenever she pleased. Vaughn's character also frustrated me, because he is portrayed predominantly through direct characterization. The reader is repeatedly told how scary he is without being given a chance to form that opinion herself. Often, I couldn't follow the logic leaps that Rhine made regarding Vaughn's actions when she isn't present and had the sense that those leaps were merely an author's tool to provide us with information about Vaughn without dipping into his perspective. Despite my nit picking, this is an intriguing book, especially with the questions raised regarding mortality, love, ethics, and gender. I am twenty-two as I write this, and would already be dead for two years in Rhine’s world. As ever, Picoult's writing is strong. You know the writing is strong when it turns invisible: when you don't need to re-read sentences, when you don't pause over awkward phrases, when every word, sentence, paragraph, and chapter flows beautifully into the next. Sadly, though, I was still disappointed with this book. 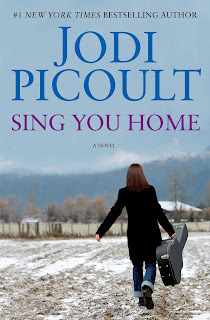 I've read three of Picoult's novels: THE PACT, MY SISTER'S KEEPER, and NINETEEN MINUTES, and adored them all, but SING YOU HOME deviated from what I usually love about Picoult's work. Let me start by specifying what I enjoyed so much about the three other books. First, Picoult’s novels force me feel with a passion that few stories can stir in me anymore. I usually find myself sobbing at least once while reading one her books, and I feel everything the characters feel: shock, anguish, betrayal, failure, confusion, and the list goes on. I even find I need a long break before I dare delve into another of her stories, since I now consider reading one of them a kind of emotional commitment. Second, there is no clear "bad guy." Picoult does a brilliant job of making you see the issue from all sides, and of mining from controversial gray areas where there is no clear right or wrong and morality is murky at best. With her past books, I could understand everyone's viewpoint and saw the conflict as a clash of opposing but equally justifiable wills. Try as I might, I couldn't pick a side and stay there for very long. The story in SING YOU HOME might have started too early and ended too early. The plot didn't catch my attention until over halfway through, and then, when I finally felt hooked, the book ended, leaving many unresolved plot threads. I never became invested in the emotional struggles of the characters, mostly because they seemed like just that: characters, not real people. SING YOU HOME tackles big issues of human identity, and yet most serious emotions are glazed over rather than directly addressed. Both Max and Zoe go through an extreme metamorphosis with an almost non-existent transitional period. In each case, I could follow the justification behind why these changes occurred, but both still felt too sudden, more like plot devices than permanent shifts that would really strike a person in a single instant. I also find it odd that a character who never doubted herself as straight could become involved with another woman without any introspection about her sexuality. There is no correct answer for how she should feel, but I wanted her to feel something. 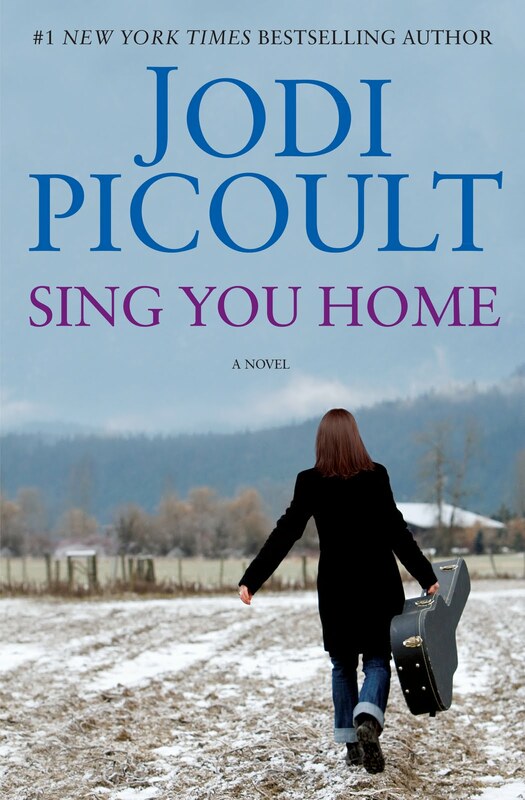 Unlike the previous books I read by Picoult, the issues presented in SING YOU HOME did seem cut and dry to me. I always knew whose "side" I was on, and I never felt torn or uncertain. This book comes from an author who usually (based on the three books I've read) writes about gray area questions of ethics and morality. (That may not be her intention, but it was my impression.) I'm upset that gay rights is now going to stand on the shelf next to her other books about uncertain right and wrong. I can't say whether Picoult intended for the reader to see things from both viewpoints, but I found it impossible to relate to the conservative side, since they were so extremist. In the other Picoult books I've read, each character's viewpoint is treated with equal sensitivity, but in SING YOU HOME, both sides walked too close to stereotypical portraits. Picoult probably anticipates some backlash for how she portrays Christians, as judgmental and prejudiced people who twist love into hate. The problem, however, isn't with the characters present, but the ones who are missing. There are plenty of Christians who strongly oppose gay marriage and who say phrases like those you will read in SING YOU HOME, so I am not claiming that these characters are unrealistic. However, the book lacks a single Christian character who feels differently. Where are the Christians who support gay marriage? Where are those who dislike it, but won't shove their beliefs on other people? Where are those who are uncertain? This book feels a little more like a didactic lesson for the "other side" rather than a fair portrait of the true scope of mentalities about gay rights. The gay community receives better treatment here than the Christian one, but still a few things left me unsettled. There's something a little odd about the words "acceptance" and "tolerance," because they imply that there is something that needs to be "accepted" and "tolerated." Really a group isn't truly "accepted" until we abandon that word, until we cease to stare and gasp, until a book about a gay couple has no shock factor. (On a side note, I want to see more gay characters in books that aren't about their gay identity, but about another part of their life journey as a human being.) An issue with SING YOU HOME, though I might be reading too much into this, is that the book revolves around a gay woman "turning" a straight woman, which I fear only reinforces one of homophobes' biggest fears, that the gay community is a cult trying to recruit us all. This might be lessened if either woman had a single prominent, non-sexual friendship with another woman, but they don't. As mentioned, the book drops off rather suddenly. The plot thread about depressed and suicidal teenager Lucy remains entirely unresolved. Her story felt more real than any other in the book and was the only one I truly cared about. Needless to say, I was disappointed when it appeared that Lucy doesn't qualify as important enough for us to find out what happened to her. SING YOU HOME includes a CD with songs written specifically for the novel. It's a brilliant idea. However, I felt a disconnect with the CD and the book - with two notable exceptions. I loved ORDINARY LIFE. Beautiful. That song is absolutely perfect for the story, and universal in general, a gorgeous song both in and out of the context of the novel. Still, my favorite was, no contest, THE MERMAID, which sings of Lucy's struggle. This was the only song that I could actually imagine Zoe singing, and one that I want to listen to over and over again, because it's so powerful. As a stylistic choice for the book, Max, Zoe, and Vanessa's chapters are each written in different fonts. This drives me crazy (in any book), since the implication is that the reader is too stupid to distinguish different characters' voices unless the difference is highlighted with varying fonts. The voice should differentiate itself. I've been rather hard on Picoult here, so I do want to add that everything else I've read by her is phenomenal. Even though I didn't enjoy SING YOU HOME as much, the actual writing is as strong as ever, and I wouldn’t have reviewed the book at all if I didn’t consider it worth reading.